Top model Dagana Bjelobrk wears “WHITE” lace top & skirt with the Roméo Rodin astonishing ‘’Marie-Antoinette’’ heels. The Sisters Code Atelier have exclusive collaboration. 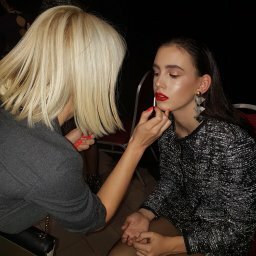 Swiss- French House Roméo Rodin, a luxury shoes brand and Narcisa Pheres, an Italian luxury jewelry brand, introducing Giorgio Armani couture muse and top model – Dragana Bjelobrk. You will discover the very first bridal line with classic designs and long silhouettes, made from the finest Italian lace and crystal tile that gives these dresses the shine needed for this special day, but also a dose of mysticism. A modern piece of dress corresponds to contemporary princesses, as it provides freedom and ease of movement and will make you enjoy your most joyful day. Top Model Dragana Bjelobrk wears “FLORA” dress with the exquisite Roméo Rodin “Emma” sandals. For a truly head-turning touch, put a pair Narcisa Pheres earrings. A one-of-a-kind luxury experience for powerful and independent women. Many celebrities such as Madonna, Beyonce, Rihanna, Amal Clooney, Michele Obama and more worldwide have chosen the Italian luxury House Narcisa Pheres beautiful jewelry. Pair it with Roméo Rodin sandals or stilettos creating an ultra-modern silhouette. Sculpted in Italian patent leather, these alluring shoes gently embrace the foot for an irresistible look of French elegance. Inspiring bloggers such as Beatrice Lessi, top model Dragana Bjelobrk, Narcisa Pheres and many more have chosen the French House Roméo Rodin. Top Model Dragana Bjelobrk wears “Champagne” lace wedding dress with the exquisite Roméo Rodin “Emma” sandals. Mitzi international Dior makeup artist recommendation: keep it modern with softly highlighted skin, enlivened with a pop of blush and a mat lipstick from backstage Dior make up collection. Top model Dragana Bjelobrk wears “WHITE” lace wedding dress and Narcisa Pheres “Valerie” diamond earrings. devotion to the smallest details combined with a futuristic view of 21st century Haute Couture. that combine the irreverence of French design with Swiss precision. An unmistakably passionate approach to design that supersedes constraints and conventions. Top Model Dragana Bjelobrk wears “NORA” mini dress in combination withe crystal tulle skirt with “Flora” statement diamond ring with the Roméo Rodin “Marilou’’ a jaw-dropping oeuvre-d’art. Top Model Dragana Bjelobrk wears “NORA” mini dress with the combination with the crystal tulle skirt with “Flora” statement diamond ring with the Roméo Rodin “Marilou’’ a jaw-dropping oeuvre-d’art. Narcisa Pheres is the Creative Director and founder of PHERES®, Italian luxury brand; Narcisa Pheres studied fashion design at Instituto di Moda Burgo in Milan and Fashion marketing at Central St Martins, London. She also got her GIA Jewelry design Certifcation at Carlsbad, USA, and she is a GIA certifed diamond expert. Top Model Dragana Bjelobrk wears “WHITE ” floral wedding dress in combination with the Roméo Rodin glamorous ‘’Étoile’ sandal. Top Model Dragana Bjelobrk wears “FLORA” dress with the exquisite Roméo Rodin “Emma” sandals pointed out with Narcisa Pheres “Ivory” diamond earrings. Her journey as a renowned designer began in 2000 where she delved into luxury fashion and high-end diamond jewelry, designing exclusive auction pieces for Japanese collectors. Since that time, “Narcisa Pheres,” is a jewelry line dedicated exclusively for fne jewelry enthusiasts, combining one-of-a-kind diamonds with breathtaking designs for the high-end market.